The 30 paintings in 30 days Challenge is officially ended. Strangely enough, even though I got the least finished paintings completed on this challenge, I got the most growth. More than the last two challenges put together. A lot of important things came to light this past month and I will let them unfold over the next few months as they come up. I always pin the studies as they are completed starting at the top left. It is educational and fun to see them all together because I can usually see the progress I make. 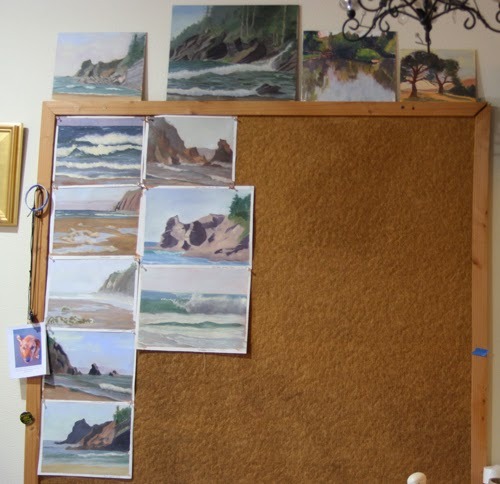 This is the second time I have filled the board with plein air studies. The first time I had 35 studies. I went a bit longer before clearing it than I should have and was sort of cramming them in. I paint on canvas that I tape to a panel for my studies. I like doing that because it is inexpensive, I am still painting on canvas, and they don't become too precious. I won't be tempted to sell my reference material either since they are not really in what would be considered a salable form. These are oil sketches, and since I don't use photos, this is what I will be relying on to paint from. Since I tape them onto a panel, there is a white boarder left when I pull off the tape. Handy to label each painting with the date and other info. There are a few studies that I did on panels. They don't get pinned on the board. 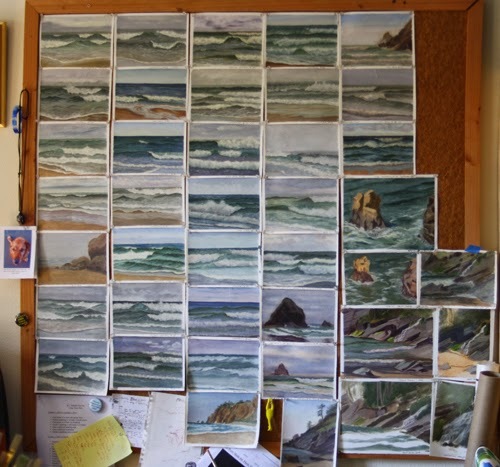 All together I have 77 wave studies plus several landscape studies. I haven't counted those yet, either in the wave study count or on their own. I haven't made it to 100 wave studies yet but I am getting there! These studies are 8"x10" and 9"x12". Up until recently, my studies have been 6"x8". I will still be painting 6"x8" studies when the situation calls for it but I will be painting larger studies too. Speaking of studies, I have quite a few Short Sands studies. I want to paint a few more but my goal is to paint a larger studio painting using these studies this winter when the winds and rains are howling around my studio. I want to do some detail studies and a few more graphite sketches this fall before the weather closes in. The sketch I posted last time is of Neahkahnie beach. This is part of the beach that is a five minute walk from my front door. That sketch is the start of an idea for a painting of that area too. I am keeping my fingers crossed that the weather will be as predicted and I can get out first thing tomorrow morning to catch the light on the waves and mountain. It was pretty stunning this morning. I am going to fill my study bulletin board as fast as I can this fall! PS, I got too curious and went back up to the studio to count the landscape studies. I have at least 24, there might be a few more stashed away too. 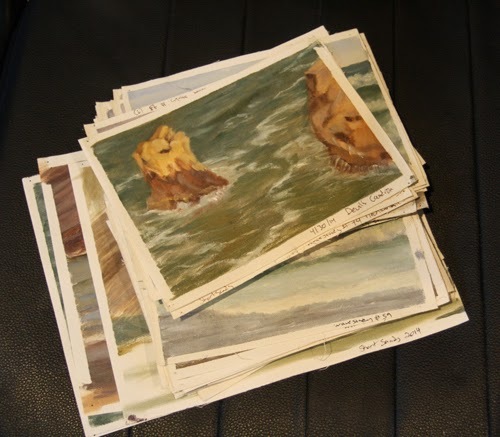 That adds up to just over 100 plein air studies, 77 of which are wave studies. Counting the finished paintings I have completed on panels I have my first well over 100 paintings done! I know that is a modest amount for some painters but it is a milestone for me. Hmmm, I wonder if I can paint double that number in a year? Look at all you have done! It must be so gratifying to see your progress. Hi Dana! Thank you. It is gratifying but most of all, it makes me determined to keep going and work hard!